The penultimate meeting of the SPR Radiological Protection Study Group in 2018 was held on November 7 and was attended by radiologists and physicists. 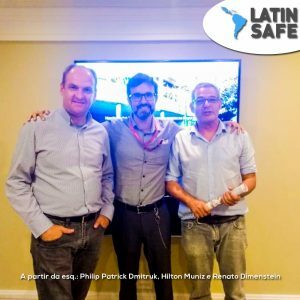 Dr. Hilton Muniz, president of Latin Safe, traditionally conducted the monthly meeting welcoming participants who were at the headquarters of the Paulista Society of Radiology and also those connected to the online meeting. He showed the news of the month on the Latin Safe website and commented on the article by Dr. Luciano Chala, who discussed issues of the Pink October, with physicists Philip Patrick Dmitruk (who works in radioprotection in Brazil and Africa) and Renato Dimenstein. As with all meetings, Dr. Hilton also invited online participants to talk and exchange ideas. Participants were: Marcos Antonio do Amaral, President of the Brazilian Society of Radiological Protection; Thamiris Rosado Reina, Supervisor of Radiological Protection of the Federal University of Juiz de Fora; Simone Kodlulovich Renha, president of the Latin American Association of Medical Physics; and Rochelle Lykawka, Tiago Severo Garcia and Ronaldo Albe Lucena, physicians at the Hospital de Clínicas de Porto Alegre. Thamiris Reina commented that the Juiz de Fora University has a group of medical physicists working on radiological protection, and on the commitment to overcoming the difficulty in the connection between physicists and radiologists. “It is increasingly necessary to join efforts of the radiologist with the medical physicist,” she said. Simone Kodlulovich talked about a questionnaire via Google Forms, prepared a few years ago with the president of the medical physics organization, focused on the area of justification to be applied only to non-radiologists. She suggested reproducing the same questionnaire or producing a similar one by Latin Safe with additional questions. According to Simone, it is important to make a diagnosis of this understanding that they have, for example, regarding CT, and then expand to other areas. “It’s a way for us to have a diagnosis of people’s understanding of this issue,” she said. Dr. Hilton approved the idea, and she set out to share this document to perhaps begin this action further. The meetings have exactly this mission: To exchange experiences and inspire other services from the existing initiatives that disseminate a safe diagnosis, optimization and justification. And, also, start new partnerships with Latin American societies and radiology and physics professionals. The last 2018 meeting of the Radiation Protection Studies Group is already scheduled: It will be held on December 5, at 5.30 pm (Brasília time), at the SPR headquarters and online. We count on your collaboration in this project so important for Latin America – see you there! The link to the December meeting is https://register.gotowebinar.com/register/6769900195185991939. "Promote through education safe diagnostic imaging in Latin America with emphasis on radiological protection"
News Sign our Commitment Letter now!